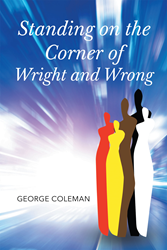 Recent release “Standing on the Corner of Wright and Wrong” from Page Publishing author George Lee Coleman is a powerful and enlightening biographical account of the author’s journey through life in this wonderful world of God’s creation. George Lee Coleman has completed his new book “Standing on the Corner of Wright and Wrong”: a gripping and potent true account of the author’s experiences and decisions in a life of devotion to God and to Jesus Christ. George Lee Coleman is the son of a former Arkansas sharecropper. He is a kind and caring person. He is someone who was raised to believe that if you work hard enough, good things will happen for you in life. He is always mindful of the duty of doing good. Remembering the words, “To whom much is given, much is required,” George Coleman’s goal in life is to help bring peace and love to an unfriendly world, and to bring warmth and compassion to a cold and distant place. He wishes to raise awareness to people who are struggling to survive. Published by New York City-based Page Publishing, George Lee Coleman’s thought-provoking tale takes readers on a journey through the author’s mind, providing wisdom and good sense. Coleman reminds readers that through the power of God and the human spirit, anything is possible. The road to the White House the 1992 election: the untold story. This is a story about the power of the human spirit, the power of the purpose, the drive that pushes us all to succeed. In this life people are faced with many decisions, should they choose love or hate, good or evil, war or peace, right or wrong. All of our goals in life should be to make the world a better place. Only love, good, peace, and right can do that. Readers who wish to experience this potent work can purchase “Standing on the Corner of Wright and Wrong” at bookstores everywhere, or online at the Apple iTunes store, Amazon, Google Play or Barnes and Noble.